For the sportscaster, see Gus Johnson (sportscaster). Gus Johnson (December 13, 1938 – April 29, 1987) was an American professional basketball player in the National Basketball Association (NBA). A 6 ft 6 in (1.98 m), 235-pound (107 kg) forward–center, he spent nine seasons with the Baltimore Bullets, and his final season was split between the Phoenix Suns and the Indiana Pacers of the ABA. One of the first forwards to frequently play above the rim, Johnson combined an unusual blend of strength, jumping ability, and speed; he was one of the first dunk shot artists in the NBA. His nickname "Honeycomb" was given to him by his college coach. He had a gold star drilled into one of his front teeth and shattered three backboards during his career. As a member of the Baltimore Bullets, Johnson was voted to the All-Rookie Team for 1963–64. He played in five NBA All-Star Games, was named to four All-NBA Second Teams, and was twice named to the All-NBA Defense First Team. His No. 25 jersey was retired by the Baltimore Bullets franchise. With the Pacers, he was a member of the 1973 ABA championship team. Johnson was inducted into the Naismith Memorial Basketball Hall of Fame in 2010. Johnson attended Central High School in Akron, Ohio, where he was an All-State high school player, and he did reasonably-well in the classroom, too. Among his teammates was Nate Thurmond, a future Naismith Memorial Basketball Hall of Fame center. Despite Johnson's clears talent and athletic ability, he had just a few college athletic scholarship offers, which was fairly common for black high school athletes in the late 1950s. Johnson had enrolled at hometown Akron, but he left before basketball started and joined a nearby AAU club. While playing for the AAU team in 1960–61, he was spotted by a former teammate of first-year Idaho head coach Joe Cipriano, and Johnson accepted Idaho's scholarship offer. He played a year at Boise Junior College (now Boise State University) to get his grades up as a sophomore, and it was at Boise that he averaged 30 points and 20 rebounds a game. Johnson then transferred up north to the University of Idaho in Moscow in 1962. The Vandals had a .500 season at 13–13 in 1961–62, and the addition of Johnson made an immediate impact as they won their first five games and were 12–2 through January. The Vandals were actually undefeated through January with Johnson playing: due to NCAA rules (junior college transfer originally enrolled at a four-year school) at the time, he was allowed to play regular season games only, not tournaments. The Vandals went 1–2 without him at the Far West Classic in late December in Portland, and the victory was a one-pointer over WSU. A week earlier with Johnson, the Vandals routed the Cougars by 37 points in Moscow. Johnson became known as "Honeycomb", a nickname Cipriano gave him because of his sweet play. 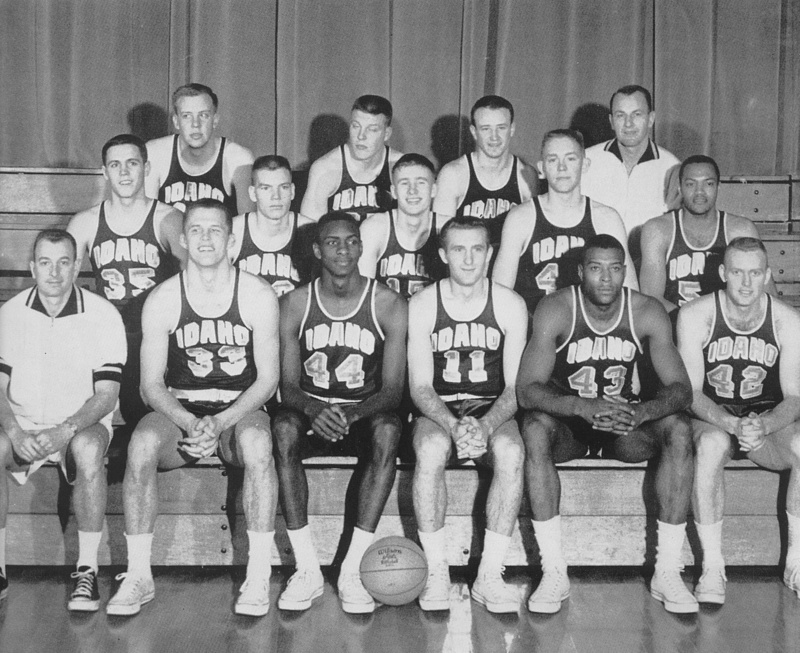 As an experienced junior, Johnson averaged 19.0 points and 20.3 rebounds per game during the 1962–63 season, leading independent Idaho to a 20–6 record, their best in 36 years. With Johnson and leading scorer Chuck White, the Vandals were at their best in their main rivalries, 4–0 versus Oregon, 4–1 versus Palouse neighbor Washington State, and 1–1 against Washington. Idaho's primary nemesis was Seattle University, led by guard Eddie Miles, who won all three of its games with the Vandals. Idaho lost its only game with Oregon State at the Far West without Johnson, but won all three with Gonzaga, for a 9–3 record against its four former PCC foes and a collective 12–6 against the six Northwest rivals. Attendance at the Memorial Gym was consistently over-capacity, with an estimated 3,800 for home games in the cramped facility. Johnson and center Paul Silas of Creighton waged a season-long battle to lead the NCAA in rebounding. Silas claimed this by averaging 20.6 per game, 0.3 per game more than Johnson's average. Johnson also set the UI record with 31 rebounds in a game against Oregon. The Ducks' head coach Steve Belko, a former Vandal, called Johnson a "6'6" Bill Russell", and "the best ball player one of my teams has ever played against..."
Despite their 20–6 (.769) record, the Vandals were not invited to the post-season. The 1963 NCAA Tournament included only 25 teams: Oregon State and Seattle U. were selected from the Northwest. The 1963 NIT invited only twelve teams, with none from the Mountain or Pacific time zones. If the Vandals had been invited, Johnson again would not have been eligible to participate. Johnson turned professional after his only season at Idaho, and Cipriano moved on to coach at Nebraska. Without Johnson (and White), the Vandals fell to 7–19 in 1963–64 and were 4–6 in the new Big Sky Conference, fifth place in the six-team league. They had a dismal 3–14 record through January and lost every game against their Northwest rivals, a collective 0–10 vs UW, WSU, UO, OSU, Seattle U., and Gonzaga. Following his professional career, Johnson returned to Moscow to help commemorate the first basketball game in the newly enclosed Kibbie Dome, held on January 21, 1976. He participated in a pre-game alumni contest between former players of Idaho and Washington State. Johnson got a somewhat late start as an NBA player, as he turned age 25 in December of his rookie season. He was selected tenth overall in the 1963 NBA draft, taken in the second round by the Chicago Zephyrs, who were in the process of moving to Baltimore to become the Baltimore Bullets for the 1963–64 season. Johnson was an immediate starter and averaged 17.3 points and 13.6 rebounds per game. Johnson finished as the runner-up for the Rookie of the Year honors to Jerry Lucas of the Cincinnati Royals; Lucas went on to a hall of fame career with the Royals and New York Knicks. Lucas and Johnson had faced off against each other during high school in Ohio, and when the NBA All-Rookie Team was selected, Lucas, Johnson, and his former high school teammate Nate Thurmond were the top three stars of the team. During their college years, Johnson and Thurmond had been overshadowed by Lucas, who drew recognition from the press as a star with the national champion Ohio State and the U.S. Olympic basketball team (1964). However, being considered just second-best in comparison with Lucas during college was a powerful motivating factor for Johnson when they both moved on to the NBA. Johnson was both an outstanding inside scorer and an exciting open-court player for the Bullets, from the start. During his early years with the Bullets, an expansion team, regularly finished in last place not only in the Eastern Division, but in the entire NBA. However, with good first and second-round draft choices every year, the Bullets gradually grew to be a better team, adding these players – who all made the NBA All-Rookie Team: Johnson, Rod Thorn, Wali Jones, Jack Marin, Earl Monroe, and finally, the keystone of a championship team, Wes Unseld, who became both the Rookie-of-the-Year and the NBA Most Valuable Player for 1968–69. Gus Johnson was also a key player for the Bullets, who won the NBA Eastern Division for their very first time in 1969. Johnson was among the most effective two-way players of his time. His scoring moves around the basket were comparable to those of his peers Elgin Baylor and Connie Hawkins. Yet, however effective as Johnson was a post-up player, with his medium-range jump shot, and on the fast break, he was even more effective as a very sticky defender and a rugged rebounder throughout his time in the NBA. Indeed, he was one of the select few players who was quick enough to be paired against backcourt great Oscar Robertson, yet strong enough to hold his own against the taller forwards of the NBA in the front line. Despite some nagging problems with his knees, Johnson was a member of the NBA All-Star Team five times. During his NBA career, Johnson averaged 17.1 points and 12.7 rebounds per game. He also scored 25 points in 25 minutes in the 1965 NBA All-Star Game. Gus Johnson had his best years with the Bullets in 1968–71, including the watershed basketball year of 1968–69. While the Bullets improved, Johnson received more recognition from the press and the spectators for his outstanding play at forward. He was voted onto the All-NBA second-team during this time span. During the 1968–69 season, the Bullets achieved their best regular-season record, but were quickly swept out of the playoffs by the Knicks, largely because Johnson was sidelined during the playoff series with an injury. After fading to third place in the Eastern Division in 1969–70, Johnson and the Bullets upset the regular-season champion New York Knicks four games to three in the 1971 playoffs, and advanced to the NBA Finals. But injuries had decimated the team, and the Bullets were swept in four straight by the Milwaukee Bucks, led by Kareem Abdul-Jabbar, Robertson, and Bobby Dandridge. Injuries kept Johnson on the bench for most of 1971–72, his last with the team. The next season, the Bullets traded for Elvin Hayes and drafted Kevin Porter, making Johnson expendable. Johnson was traded to the Phoenix Suns following the season in April, but played in only 21 games before being released on December 1, 1972. The Indiana Pacers, then of the ABA, picked him up and he became a steadying veteran influence on the team, which went on to win the 1973 ABA championship. Injuries limited Johnson's pro basketball career to 10 seasons, and this no doubt prevented post-career honors such as inclusion on the NBA 50 Greatest Players Ever list, and a delayed induction into the Hall of Fame. His induction in 2010 came 37 years after his final game and 23 years following his death. Shortly before his death from inoperable brain cancer, his No. 25 was retired by the Washington Bullets (now Washington Wizards) on his 48th birthday. A month later he was also honored by the two college programs he played for, Boise State and Idaho, during a conference basketball game between the two teams on January 17, 1987. A crowd of 12,225 at the BSU Pavilion in Boise set a Big Sky attendance record for a regular season game, and the visiting Vandals overcame an eight-point deficit in the second half to win by ten. That month in a ceremony in Akron, his No. 43 was retired by Idaho, the first basketball number retired in school history. Johnson died less than four months later at Akron City Hospital on April 29, 1987, at the age of 48. He is buried at Mount Peace Cemetery in Akron. Earl Monroe had said of Gus Johnson – "Gus was ahead of his time, flying through the air for slam dunks, breaking backboards and throwing full-court passes behind his back. He was spectacular, but he also did the nitty gritty jobs, defense and rebounding. With all the guys in the Hall of Game, Gus deserves to be there already." While Johnson was at Idaho in 1962–63, he earned a reputation as a leaper of the highest order. On one evening at the "Corner Club", a tavern on north Main Street in Moscow, Johnson was challenged by its owner, Herm Goetz (1925–93), to demonstrate his outstanding jumping ability to the assembled patrons. The "Corner Club" was a modest establishment with minimal furnishings, converted to a bar in 1948 from a small white stucco chapel with hardwood floors and substantial beams on its ceiling. From a standing start near the front bar, Johnson leapt to touch a spot on a beam 11 ft 6 in (3.51 m) above the floor level. The spot on the beam was marked with a ceremonial nail by Goetz, who next proclaimed that anyone who could duplicate that leap could drink for free, something that he knew was highly improbable. A 40-inch (1 m) diameter circle was painted on the floor below that beam, and any potential duplicator of the leap had to have both feet on the floor, within this circle, to ensure a standing start. Twenty-three years elapsed, with a considerable number attempts to touch Johnson's Nail, including some by the 6 ft 11 in (2.11 m) UCLA All-American Bill Walton during the summer of 1984. But not even Walton, then a pro at age 31, could touch that high up ("...too much pizza and beer tonight.."). That was until late January 1986, when the team bus of College of Southern Idaho, a junior college in Twin Falls, stopped in Moscow, en route to a game against North Idaho College in Coeur d'Alene. Joey Johnson, the younger brother of the NBA star Dennis Johnson, was brought into the closed bar by his coaches for a try, before opening time. The 6 ft 3 in (1.91 m) guard had already recorded a remarkable 48-inch (1.22 m) vertical leap during basketball practice. Johnson laced up his game shoes and touched "The Nail" on his first try, but this attempt was disqualified because he did not start with both feet inside the given circle. His next attempt came from a legal static start, but was slightly short. On his third try, Johnson leaped, grabbed, and bent the legendary nail, a landmark event in local sports history. Goetz next pulled "The Nail" out of its beam, and he pounded it back in, a half inch (1 cm) higher. A 1985 graduate of Banning High School in Los Angeles, Joey Johnson led CSI to the national junior college title in 1987 and also won the national JC title in the high jump twice. He transferred to Arizona State, where his vertical leap grew to 52 inches (1.32 m) and he was known as "Jumpin' Joey." He played for the Sun Devils during the 1987–88 season, and won an elevated slam dunk contest at 11 ft 7 in (3.53 m) in 1990, earning $50,000. Following Gus Johnson's death in 1987, flowers were found hanging from The Nail. Due to road reconstruction on north Main Street (the widening and straightening of the couplet for US-95 north), the entire original (west) portion of the Corner Club was demolished in January 1991. Unfortunately, the condemned portion of the establishment included the original location of "The Nail." The back (east) addition, built in 1981 of cinder blocks, was left standing. The Corner Club, at the northeast corner of "A" and Main Streets, opened for business in July 1948 and had staved off its demolition for over a decade; it was targeted for removal for the traffic revision since the late 1970s. In 2005, the Corner Club was listed by Sports Illustrated as one of the best sports bars in the nation. ↑ Smith, Marlin (December 31, 1997). "How Great Was Gus Johnson?". ↑ "Naismith Memorial Basketball Hall of Fame Announces Class of 2010" (Press release). Naismith Memorial Basketball Hall of Fame. April 5, 2010. Retrieved April 5, 2010. 1 2 Pluto, Terry (September 4, 2010). "Stories of former NBA star Gus Johnson are no tall tales". cleveland.com. ↑ "Record crowd sees Vandals top Boise State". Lewiston Morning Tribune. January 1, 1987. p. 1B. "Basketball". Gem of the Mountains, University of Idaho yearbook. 1963. p. 248. Blinebury, Fran (August 5, 2010). "At last, the Hall of Fame gets a taste of 'Honeycomb'". NBA.com.